Lt. Col. Tom Keegan of the 129th Rescue Squadron based at Moffett Federal Airfield, Calif. has been assisting in firefights for 15 years, and he’s still taking on more. For up to seven hours a day, Keegan and his crew fly an HH60G Pave Hawk with attached Bambi buckets full of water over the parts of California affected by wildfires this summer. At one point there were almost a dozen fires burning throughout the state with varying levels of containment. The California National Guard, California Emergency Management Agency and California Department of Forestry and Fire Protection have been working together to protect the 411,000 acres damaged or affected by the fire. “There are a lot of roles here, but it’s more about the team effort than just single helicopter drops that help put out the fires,” Keegan said in a recent interview. Guard helicopter crews have flown more than 365 hours and conducted 1,062 water bucket missions while dropping more than 508,000 gallons of water across the state since being activated Aug. 7, according state’s military public affairs office. Keegan and his crew begin their day assessing a “plan of attack” from their commanders — looking at possible weather hazards, fire transformation from night to morning, improvement strategies and objectives for containment — and then coordinate with ground assets on where to start. 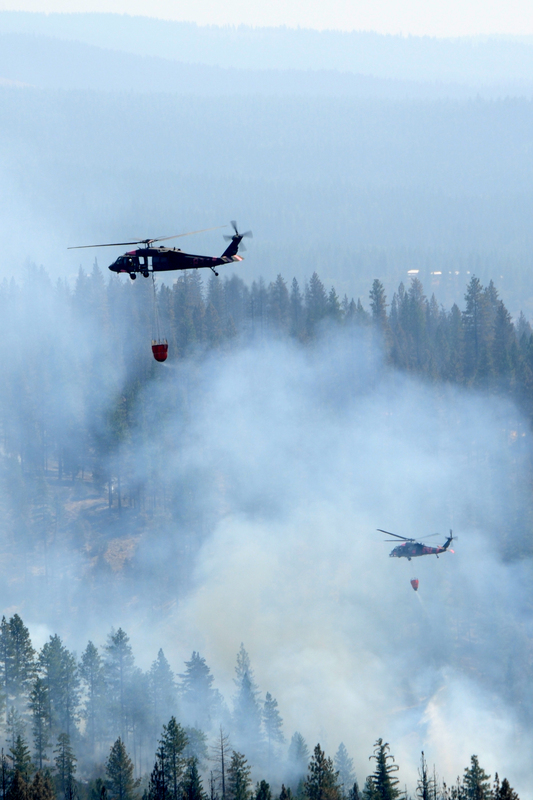 Their air support comes from eight Guard helicopters and one Modular Airborne FireFighting System (MAFFS)-equipped C-130J aircraft that cover the northern California blazes. Keegan said weather conditions are so hot and windy that fire season will likely last through November. “There is always that possibility for new fires to spark up, with areas changing all the time,” he said. Community involvement in the firefighting has been widespread, Keegan said, ranging from first-responder agencies to shelter groups to a large diversity of landowners — federal and state — who are allowing Guard members permission to use rivers, ponds and lakes close to the fires to fill their Bambi buckets. The 129th Rescue Squadron is usually on call for search-and-rescue missions over the Pacific Ocean, vessels in distress, and searches for missing people in mountain valleys in the U.S., along with deployments to Afghanistan, Keegan said. But for now, he and his crew understand where they’re needed. “We have a dual role to be ready for wars and operations overseas, but also to state missions that provide mercy support to the state of California and its citizens here,” Keegan said. Look for wildfire updates on the Guard’s Facebook page, check out photos of the California National Guard in action, and view YouTube videos of their efforts from the sky.